Note: The first three photos in this post were shot with my iPhone – when you don’t have a real camera with you, it’s cool to have something, anything to shoot with – and the iPhone actually does a pretty good job! 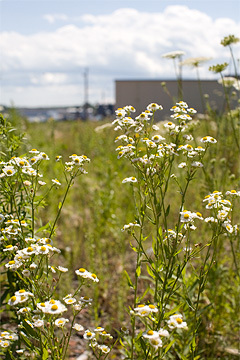 The last image was shot with a “real” camera. As soon as my seminar in Atlantic City ended, I hopped on a plane for Ottawa. 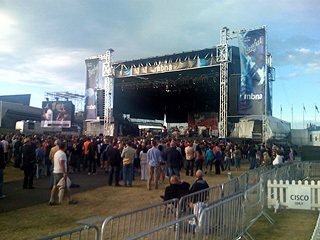 One of the members of RockBandLounge.com had arranged a BIG party at the Ottawa Bluesfest, the night INXS was headlining. She’d convinced them to give us a corporate box, complete with our own private bartenders, plus catering. I just couldn’t miss that! I wanted to see INXS, but the real draw for me was meeting the Canadian members of the forum. Over the last two years I’ve become really close to some of them, and it was starting to seem really odd that we’d never met in person. It was just time to make that happen! And I wasn’t the only American who felt that way – we ended up with two of us from California, one from Seattle, one from Texas, and half-a-dozen from the East Coast of the United States – plus a lot of Canadians! It was a magical night. The venue was really beautiful, and the sky though filled with storm clouds in the distance was completely clear over the concert. No rain at all! And so many people! The crowd was really huge, and soooo enthusiastic. 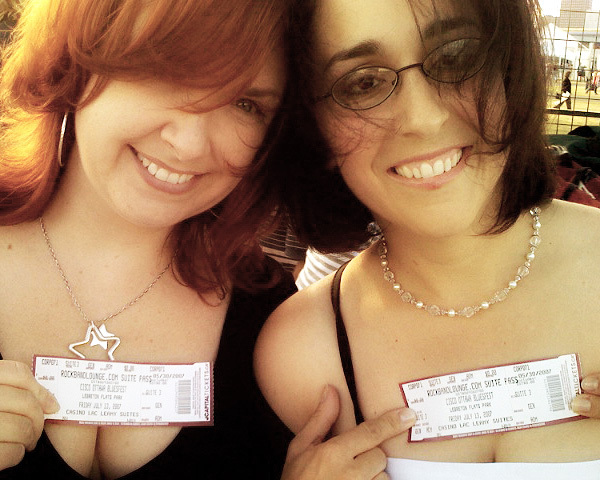 It was my first INXS concert in over a year, so I really enjoyed it. Plus it was kind of fun to sing along to those songs with people that I shared Rock Star with – and who agonized over who INXS should choose, and would their “guy” win. They’re a passionate crowd – my kind of people! And the tickets? They were printed with RockBandLounge.com on them! How fun is that? The girls above are two of my favorite Canadians! The audience was invited to submit text messages that scrolled by on a big billboard on one side of the stage – and there were a lot of messages about our group. It was obvious we were having a lot of fun, and people noticed! There were messages asking if any of us were single, if we wanted company, and the messages got progressively saucier as the night wore on. Anyone with a General Admission ticket couldn’t get up to where we were, but people in the other corporate boxes could, and some of them left their own groups to come dance with us. It was that much fun! Ottawa was great! 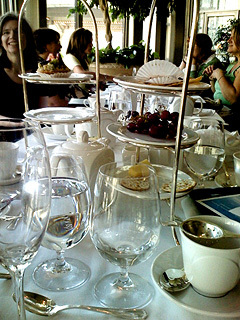 We even went to high tea at the Fairmont Hotel – very, very classy! And since I was going all the way to Canada, it made sense to go to more than one concert – there were three all within driving distance, so several of us planned to hit all three. But as the planning progressed, and the dates got closer, the thought of that much driving seemed like a bit much to some of the group, so we decided to fly instead. I was sort of looking forward to seeing more of the country, so flying wasn’t my first choice, but it turned out to be a smart decision, since we then had more time in each place to explore. It was my first time on a tiny little plane – you know the kind you have to walk out onto the runway, and then climb stairs to get to? And there are only ten rows of seats? And they go bump, bump, bump, and knock, knock, knock? At first it was a little scary, but after I got used to it, I actually enjoyed it. Especially flying over the lakes – so much water you’d swear it was an ocean. I had a front row ticket for Barrie, Ontario, and second row for Sault Saint Marie – so I definitely got my INXS fix! All of the shows were a lot of fun, but I think the highlight of the trip (after the socializing) might be discovering Sault Saint Marie. I finished out my trip with a couple of days in Toronto – a very nice city – but Ottawa and Sault Saint Marie are so special, it’s hard for Toronto to compete in my mind! Just a quick note about the photography seminar I went to – one of the days was spent with a photographer I find really inspiring – John Michael Cooper. I shot this with my iPhone – its JMC and his wife Dalisa, working with a couple of models under the pier near the Trump Taj Mahal, in Atlantic City, New Jersey. 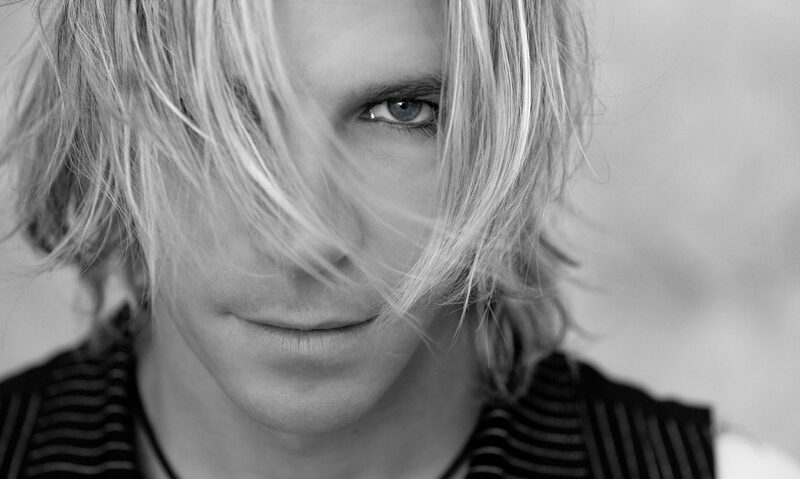 I came away from his presentation completely blown away – he’s that good! I just love it when another artist can knock me out like that – it’s really rare, and wonderful. He was definitely the highlight of the whole week! 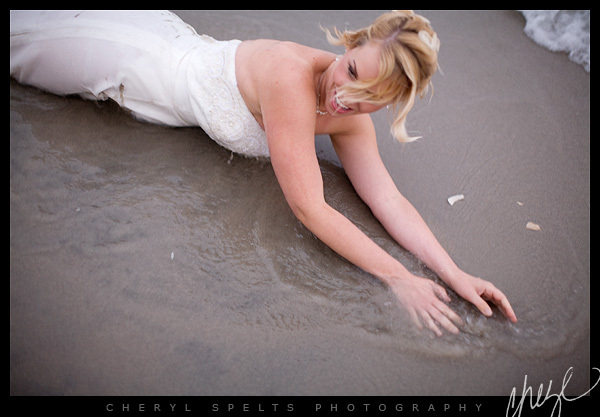 The hot trend in photography right now is something called “Trash the Dress.” Basically it’s a bridal session after the wedding, where the photographer and client can create crazy-beautiful images without having to worry about keeping the dress perfectly clean and unwrinkled. “Trashing the Dress” is a catchy name, but it’s usually a misnomer since it’s rare for the dress to actually be ruined. 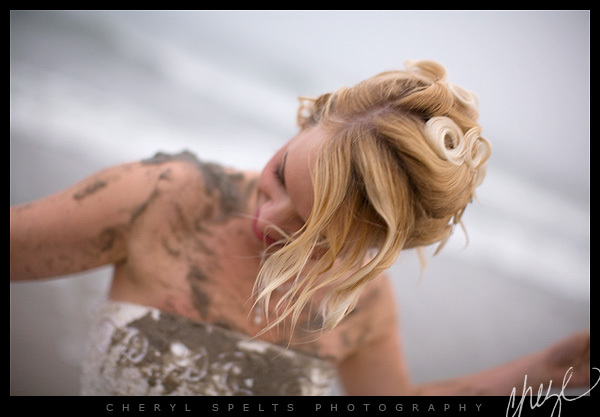 The dress may get a little dirty – or wet – or sandy – depending on where the session takes place, but even that isn’t necessary. 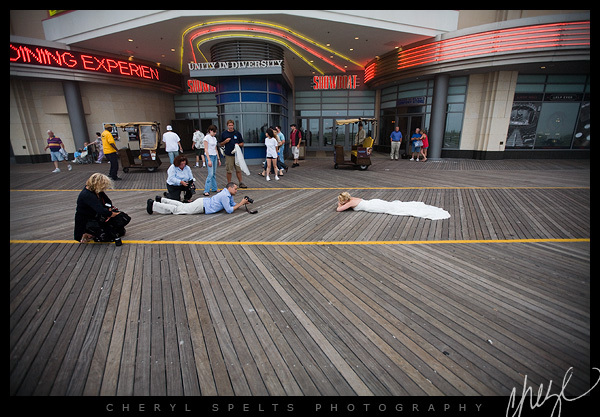 I attended a seminar for photographers in Atlantic City last week and a couple of the participants decided it was the perfect opportunity to put together this type of session. Twelve brides, over fifty photographers, and two TV stations showed up. It was a BIG deal – and a lot of fun! 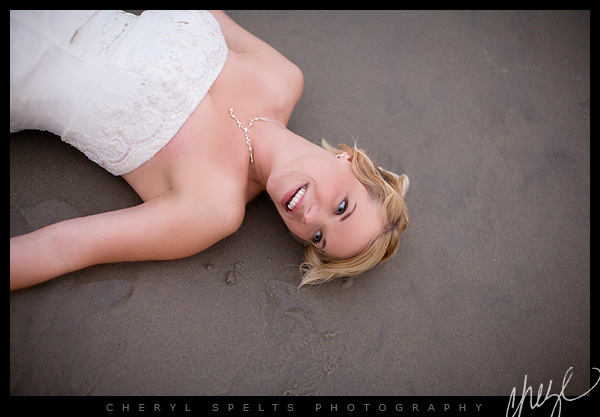 We were divided into groups and “assigned” a bride – I got lucky! 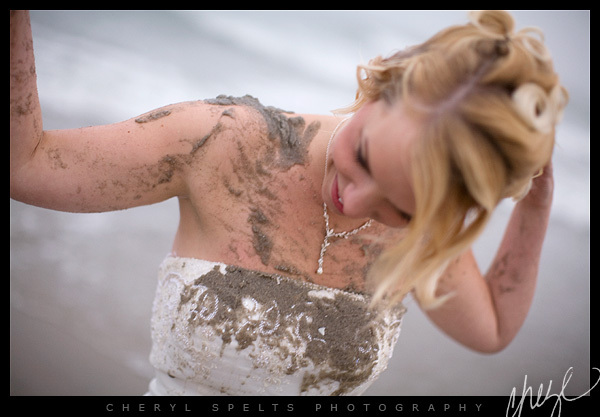 Sandy was beautiful, had a great dress, and was perfectly willing to get wet and muddy. The weather in Atlantic City had been muggy all day, and the fog was really low – it was beautiful and very different than what I’m used to in Southern California. Overall it was a great experience! And knowing the story appeared not only on the local New Jersey and Philadelphia TV news, but also on German TV made it especially fun! And click here to see a series of images of Sandy playing in the surf – it’s huge, but in my opinion, worth it!